It is hard to believe that we only decided to classify one VT in 2008. It certainly can be explained by the fact that the perfect acidity of the vintage helped to hide a lot of the sweetness in the wines. 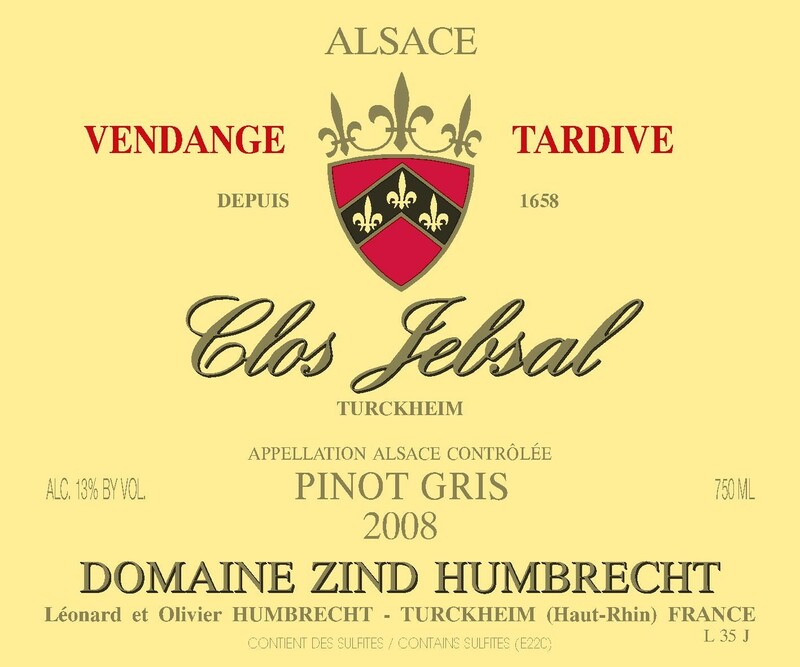 However, Jebsal doesn’t fail to its reputation and both wines made in 2008 from that little Clos are VT and SGN. It is located in a very warm microclimate, just under the Brand, on a very steep south facing terraced vineyard. This precocious climate explains that the vines ripen the grapes very quickly. The vines are growing on perhaps one of the richest soil on the estate: deep combination of marl and gypsum that explain the fact that the vines never suffer drought here and are capable of keeping high acidity in the grapes. The drying effect of botrytis, especially when developing fast, also concentrates acidity as well as sugars. This vineyard is capable to produce extreme concentrated wines without any effort. The vines are now slowly reaching a more mature behaviour and we can see more and more minerality and subtlety in the wines from the Clos Jebsal. 2/2010: the botrytis selection we made in this vineyard left enough botrytis so the remaining grapes were ripe enough for VT standards. The nose shows delicate nutty and toasted aromas with great minerality. This is confirmed on the palate with crisp acidity and very stony flavours. The fermentation was very slow and this wine is still today in cask on its fine lees for more ‘élevage’ time. It will probably be bottled in September 2010.